Who was “Dr. Seuss” at Dartmouth? An athlete? A scholar? A trickster? The Dartmouth Mirror sat down with English professor and the Ted and Helen Geisel Third Century Professor Donald Pease to find out. He is the author of “Theodor Geisel,” a biography about the Dartmouth ’25 and popular children’s book author known as Dr. Seuss. To further understand the enigmatic Dr. Seuss, I consulted materials from Rauner Special Collections Library, which holds countless articles about Dr. Seuss, some of his original advertisement work and his articles for Dartmouth’s The Jack-O-Lantern. Geisel was born and raised in Springfield, Massachusetts and was inspired to attend Dartmouth by one of his English high school teachers, Red Smith, who graduated from Dartmouth in 1917. At Dartmouth, Geisel’s inspiration to write came from professor W. Benfield Pressey who taught creative writing and poetry at the College. Geisel’s family owned a brewery but lost their business during Prohibition. Again, at the start of World War II, they suffered reputation damage because they were German. As a result, Geisel came to Dartmouth looking for family. 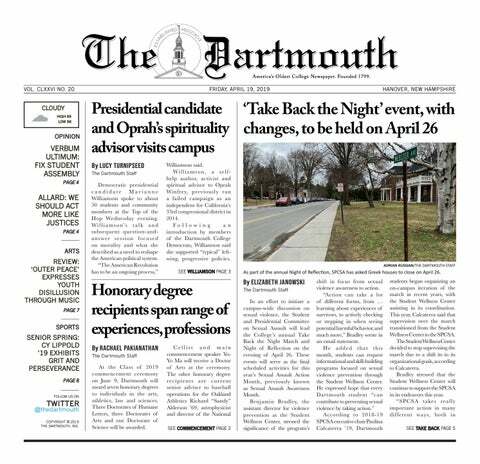 “Dartmouth was his family in the deepest sense,” Pease said. Geisel wrote for The Jack-O-Lantern, a successful Dartmouth-student-produced satire magazine that was sold in newspaper stands in cities such as New York City, New York and Chicago, Illinois. After becoming the editor at the end of his junior year, the magazine was one of his main commitments. He was a self-described “workhorse” when it came to his involvement with The Jack-O-Lantern, according to a 1976 article in the Dartmouth Alumni Magazine. Geisel took a few economics and psychology classes, but majored in English and focused on creative writing. He graduated with a 2.4 GPA. Geisel adopted his pen name after an infraction his senior year at Dartmouth. The Dean of the College at the time, Craven Laylock, was known for strictly enforcing Prohibition. However, Geisel and other friends from The Jack-O-Lantern were caught with alcohol at a party. Laycock called Geisel’s father and asked him what would be an appropriate punishment. “[Geisel’s] father said, ‘Take away his editorship [because] it means a lot to him and he’ll learn his lesson,’” Pease said. Laycock ordered Geisel to end his involvement with the magazine, which devastated him. However, after a few weeks, he started using the pen name, Seuss — his middle name — which Laycock was not aware of. Geisel was then able to get away with continuing to publish his work. Geisel also discovered that this pseudonym gave him some kind of power. “[Geisel] intuited that the name had put him in touch with a whole mother lode, literally, of creativity that he wouldn’t learn fully how to harness until he decided to became a children’s book writer,” Pease said. After graduating Dartmouth in 1925, Geisel attended University of Oxford, where he planned to pursue a doctorate in English. However, he only attended for a semester. There, he met his first wife, Helen Palmer, who was sitting behind him and noticed him drawing little cartoons. Pease said Palmer told him that Seuss didn’t want to be a professor, but rather a cartoonist. Geisel’s pen name included the title of “Doctor” because his father had always wished he had earned a doctorate. After Oxford, Geisel was a very successful cartoonist in New York, where he had a reputation for making great advertisements. “He was considered a wizard of salesmanship,” Pease said. Pease said that one of his favorite things about Geisel was “[h]is willingness to take chances with his career.” Geisel decided to follow his passion even though he could have gone to Hollywood or continue to do advertising work, Pease said. Geisel did propaganda work for the war effort in the years before the U.S. joined World War II. After the nation joined the war, he began work with the U.S. Army. “President [Franklin] Roosevelt said that if it hadn’t been for Dr. Seuss, prior to Pearl Harbor we wouldn’t have had the collective sentiment to get into the war that Pearl Harbor finally triggered,” Pease said. Pease added that Geisel started writing children’s books after the end of World War II. He did this for the children of the men and women that went to war, Pease said. With his books, Geisel not only spread joy among children, but also ignited a love of reading within them. In 1999, The Times of London wrote that the “The Cat in the Hat” wasn’t just any other book, but one specifically commissioned because of the declining literacy of children in the U.S. in the 1950s. Geisel is renowned for his eccentric writing style that appeals to children in a genuine way. Geisel died on Sept. 24, 1991, from oral cancer. “Oh, the Places You’ll Go!,” published in 1990, was the last book that Geisel wrote, and it fittingly explores the journey of life and the challenges along the way. “[That] was his ‘letting-go’ book,” Pease said. The original version of this article stated that Geisel died on Sept. 25, 1991, when in fact he died on Sept. 24 of that year.